Welding is not a recent development, but is continually evolving to suit different design and manufacturing requirements. Many joins required to withstand heavy loads were joined using hot riveting, where a red-hot rivet was placed through two overlapping sections of metal and hammered over. As the rivet cooled it contracted, forming a tight join between metal parts. Ships, bridges, buildings and pressure vessels for steam engines were all made using this process. The first welds during the bronze age involved the application of heat from a fire and pressure from hammering to join metals. This developed into what is known as forge welding used by blacksmiths. Forge welding produced welds which were crude by today’s standards and were only possible on low-carbon steels or wrought iron. With the discovery of acetylene in 1836, the use of high-temperature gas flames to generate welding heat became a reality. Although hydrogen and coal gas were used with oxygen, gas welding did not take off until the end of the 1800s, when the low pressure acetylene torch was invented. The development of the oxyacetylene gas torch allowed the generation of high localised temperatures, making it possible to weld steel. The use of bottled gas further increased the versatility of the oxyacetylene set, which is still used today in a range of welding, brazing, soldering, cutting and gouging operations. Even though electric arc welding was first invented in the late 1800s, it took a long time to catch on. The first electric arc welds were produced with a carbon arc torch, where an electric arc was struck between a carbon electrode and the work. Heat was generated and a filler metal added to complete the weld in much the same way as oxyacetylene welding. Soon the arc was struck between an uncoated consumable electrode and the work, with the filler metal travelling across the arc and into the weld, eliminating the need for a separate filler rod. In 1900, clay and lime were the first electrode coatings used to create a more stable welding arc. By about 1930 electric arc welding had gained wide acceptance, with coated stick electrodes used to produce high-quality welds. Around this time, tests were being carried out using gas to shield welds and wire being continuously fed through a nozzle to provide the filler metal. 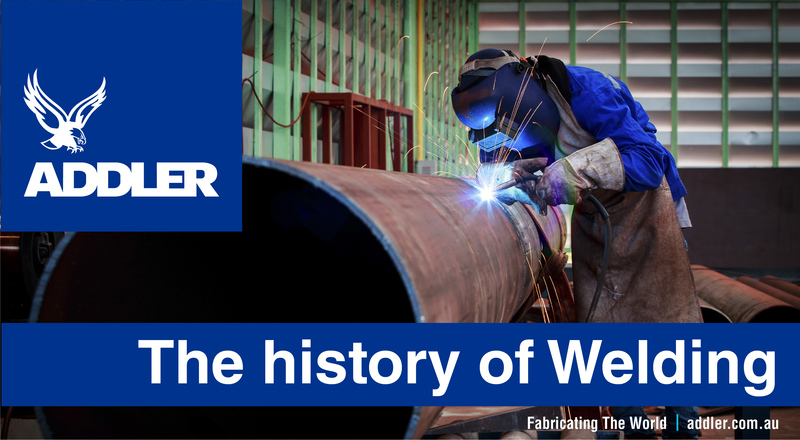 These experiments eventually led to the development of gas metal arc welding in the late 1940s, which is today more commonly known as MIG welding. TIG welding was introduced in 1941, which uses an electric arc between a tungsten electrode and the work piece to produce heat. Filler metal is added using a separate rod and weld shielding is taken care of by an inert gas. TIG welding has become available to smaller workshops in recent years, as welding units become cheaper and more versatile. Welding is not an unlearnable art, and anyone can produce reasonable results given guidance and a little practice. The further operators develop their skill level, the more demanding jobs they will be able to tackle. It is impossible to teach someone how to weld from a book only. Welding is a practical activity that requires a level of skill that can only be developed through practice. The guidance of an experienced welder is invaluable to those learning to weld. The skills required for some welding tasks are only developed after years of practice and experience, and not simply from reading a book. A boilermaker who repairs or builds a pressure vessel must have a certified level of skill to ensure the welds never fail, as the results could mean death or serious injury. Fortunately welding around the home, workshop or farm should not involve such situations.